Millennium Films and Corsan Pictures have announced a new project in the works titled Killing Season, that will start shooting in January. The action project, written by Evan Daugherty (Snow White and the Huntsman), was originally titled Shrapnel and is set in the Appalachian Mountains starring Robert De Niro and John Travolta as two unlikely friends who meet at a cabin and end up going mano-a-mano, or something like that. The news comes from a press release leading up to the American Film Market this week (via ComingSoon), but attached with it was some sales artwork featuring two shadowy figures with rifles. 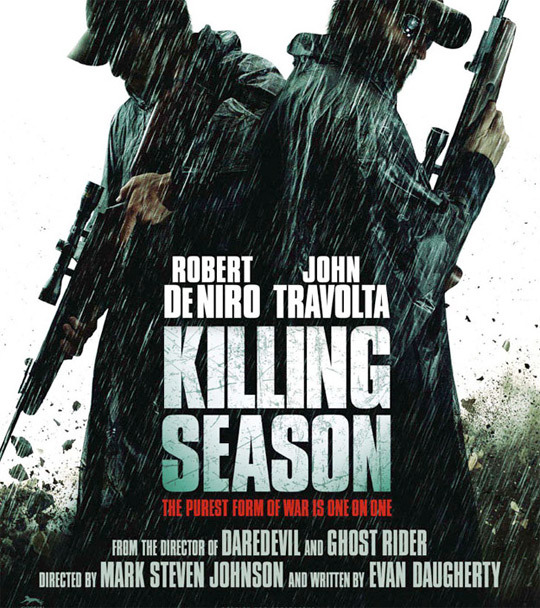 Killing Season is an action movie, to be directed by Mark Steven Johnson (Ghost Rider, Daredevil), set in the Appalachian Mountains about an American military veteran (De Niro) who has retreated to a remote cabin in the woods. When a rare visitor, a European tourist (Travolta), appears on the scene, the two men strike up an unlikely friendship. But the visitor is a former Serbian soldier bent on revenge. What follows is a tense, action packed battle across some of America's most forbidding landscape that proves the old adage: the purest form of war is one-on-one. "It's thrilling, imaginative, unexpected and dominated by two extraordinary characters on a collision course," says Corsan CEO Paul Breuls. Sounds like it might be cool. "We're excited to be co-financing and co-producing this film with Corsan, and to be working again with Robert De Niro and John Travolta," said Nu Image/Millennium topper Avi Lerner. "We've never seen these two great actors on screen together before, and we're excited to see what comes of the combination." Is that true? Either way, I definitely think the casting is the most exciting part about this. I just hope Mark Steven Johnson can make a better movie than his last few films. Sales art can be seen in full below. "I've loved this project from the moment I read Evan Daughterty's remarkable script," says Breuls. Hope it turns out great! "From the director of Daredevil and Ghost Rider" ???? I thought the purpose of the poster was to excite people and make them want to see the film. He might want to remove the "Director of Daredevil and Ghost Rider" part if the purpose of this poster is to generate a good buzz. I misread that as "pour piss on this fire". Hahaha, the brain is a funny thing. He's made action films in the past. Broken Arrow, Face/Off among others. why do they still let him making movie, after those two horrible films? Uwe Boll, anyone? There's no reason for it. They just do. Ya I don't think they have played in a movie together before so this should be good. Get a new director on board or else it will be terrible. De Niro is a massive massive hero of acting of mine and Travolta is not too far behind. But having good actors means nothing when at the helm is a person that has a terrible rep and is a cheesy action superstar. This movie WILL be bad if Steven Johnson is directing. It just really seems that all the "talent" involved have a terrible track-record in movies as of late; I cant imagine that putting all these piss-poor, crap-movie companions together will bring good results.